Sarah Hurley 365 (Formerly Sarah Hurley Challenges): "Be Amazing" 10 minute make. Hello, it's Carol here today and no it's not an April Fool lol. Today I am sharing one of my "10 Minute Make" Cards made using just two stamp sets and some Distress Inks. I love Sarah's Doodle Doll Stamps and how well they all work together, I used the arty extras from the Art Girl Stamps and the sentiment from Be Amazing Girl Stamps. It actually took me longer to decide which colours of ink to use, but that isn't unusual for me lol. I cut a piece of white stamping card to size and got all my pretties ready to get creative. I stamped a line out with the circles from the stamp set, then got the splash and brushstroke stamp and stamped them out in different colours. I just love the new Limited Edition Distress Inks, don't you? 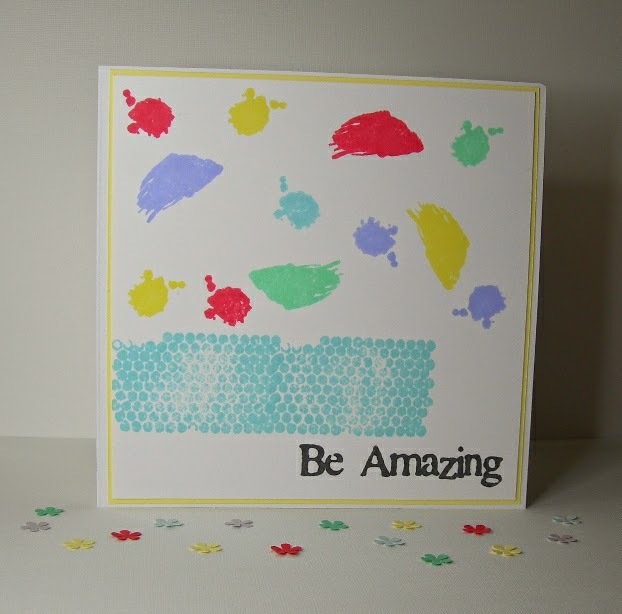 I stamped on the "Be Amazing" Sentiment in Tuxedo Black Memento Ink as a contrast to the pastel colours. I used some double sided tape to stick it down to some lemon coloured paper and used my Perfect Layers ruler to make a wee border round the card. I then popped that onto my card blank. I hope this shows that "10 Minute Makes" can be inky and fun! Thanks for stopping by today, remember to visit again soon to see what the other #TeamHurley girls are up to. Oh Carol I love those splashes of colour. It makes the whole card so funky and bright. Brilliant 10 minute make.